Our delicious nachos topped with beans, guacamole, onions, sour cream, tomatoes and cheese. Add $1.00 for meat. Our delicious nachos with shrimp topped with beans, guacamole, onions, sour cream, tomatoes and cheese. Lightly fried potato skins filled with beans and cheese, tomatoes, onions, guacamole, and sour cream. Add $1.00 for meat. Corn tortillas tightly rolled around a filling of shredded beef or chicken. Topped with fresh lettuce, sour cream and guacamole. Flour tortillas tightly rolled around a filling of shredded beef or chicken. Topped with fresh lettuce, sour cream and guacamole. Sautéed mushrooms in butter with garlic and melted Monterey Jack Cheese. Mushrooms sautéed in garlic butter and spices. Slightly hot! Deep fried flour tortillas topped with melted cheese. Jalapeño peppers stuffed with real cream cheese, breaded and deep fried. Buffalo wings roasted and topped with pepper, garlic, and slightly hot sauce. Flour tortillas stuffed with melted cheese, onions, tomatoes, sour cream and guacamole. Add $1.00 for meat. Deep-fried flour tortillas topped with beans, meat, cheese, tomatoes, sour cream and guacamole. Nachos, quesadillas and chicken taquitos served with guacamole and sour cream. Sautéed in butter with mushrooms and special spices. Served on a bed of rice. Slightly hot! Chicken or beef carnitas covered with fresh lettuce greens in a crispy flour tortilla shell. Served with guacamole, sour cream and salsa Mexicana with your choice of dressing. Choice of picadillo (shredded beef), ground beef or chicken. Our traditional taco salad is served on a hot plate with cheese melted over the meat, then topped with lettuce, cheese and tomatoes. If you prefer a crispy taco shell (Northern style), this can be done for an additional $.50 - please tell your server. Fresh romaine lettuce, tomatoes, broccoli, cucumbers, cauliflower, peppers, mushrooms, carrots and croutons. Served with your choice of dressing. Traditional Mexican salad made with picadillo (shredded beef), lettuce, tomatoes, onions, avocados and green olives. Marinated in our vinaigrette dressing and served in a large tortilla shell. Please allow 20 minutes. A delicious Mexican soup made with fresh minted pork meatballs and seasoned vegetables in a clear broth. Served with diced onions, cilantro and warm tortillas. A meal in itself! A delicious fresh prawn soup with avocados, cilantro, tomatoes and onions. Served with crackers or tostadas. A delicious fresh prawn, scallop and fish soup. Prepared with avocados, onions, cilantro and cucumbers. Served with crackers or tostadas. Flour tortilla filled with rice, cheese and meat garnished with fresh lettuce, tomatoes, sour cream and guacamole. Fresh bell peppers, onions, tomatoes and mushrooms sauteed with butter and spices. Rice and beans, then wrapped in a flour tortilla. Topped with guacamole, tomatoes, onions and parmesan cheese. One chile relleno, rice, beans and cheese wrapped in a flour tortilla smothered with guacamole, tomatoes and onions topped with parmesan cheese. Choice of meat with rice, beans and cheese wrapped in a flour tortilla then topped with guacamole, tomatoes, onions and parmesan cheese. Delightful array of fresh vegetables with rice, beans and cheese wrapped in a flour tortilla then topped with guacamole, tomatoes, onions and parmesan cheese. Choice of chicken or steak wrapped in a flour tortilla and topped with melted cheese then smothered with guacamole and sour cream. Soft flour tortilla filled with carne asada, salsa Mexicana, rice, beans, guacamole and sour cream. Boneless slice of marinated pork cooked in a very authentic Mexican way wrapped in a soft flour tortilla with salsa Mexicana, rice, beans and cheese. Choice of Meat . Topped with one egg over easy. Two tortillas (Flour or Corn) Filled with Chicken, Covered with Sour Cream Sauce, Monterey Jack cheese with Coleslaw and Avocados. Shredded Chicken topped with a delicious sweet Mole Sauce. Deluxe combo of scallops, shrimp, fish, onions, bell peppers, mushrooms, carrots and celery all cooked together on the grill, accompanied with guacamole, sour cream and salsa Mexicana. Served with rice and beans. Spring mix lettuce, tomatoes, cucumbers and onions, with home made flour tortilla, topped with fish. Spring Lettuce Mix , tomatoes and onions, dried cranberries, roasted sweetened pecans, topped with marinated grilled chicken and parmesan cheese. Spring mix lettuce, mandarin segments, tomatoes and cucumbers, shredded carrots, topped with dried cranberries and roasted sweetened pecans. Spring lettuce mix, mandarin segments, shredded carrots, topped with marinated grilled shrimp. Spring lettuce mix, sliced tomatoes, mushrooms, shredded carrots, onions, with marinated grilled sliced steak. Steak butterflied and flame broiled to your liking. Served with guacamole and your choice of warm tortillas. Tender pieces of steak flame broiled, sliced and folded into homemade soft corn tortillas with mild salsa Mexicana, fresh cilantro and parmesan cheese. Delicious grilled Asada steak. Served with a chicken mole sauce, enchilada, rice and beans, guacamole, green onions and warm tortillas. Lean strips of top sirloin sauteed with tomatoes, onions, green peppers, and spices. Served with warm tortillas. T-Bone steak marinated and broiled in a very special way. Served with guacamole. Beef simmered until very tender in a red sauce of tomatoes, onions, mild peppers and spices. Served with warm tortillas. Pork loin braised in green sauce of special fresh tomatillos (Mexican tomatoes), green peppers, onions and spices. Lean Pork Loin grilled and served with Spicy Tomato Sauce and warm tortillas. Steak butterflied and flame broiled to your liking. Topped with grilled onions and guacamole. Served with warm tortillas. Marinated steak with salsa Ranchera sliced and folded into homemade soft corn tortillas with mild salsa Mexicana, fresh cilantro and parmesan cheese. Top sirloin strips with green peppers, onions and guacamole. Three large prawns wrapped in bacon served with crab enchilada topped with green tomatillo sauce and monterey jack cheese. Garnished with sliced avocado and sour cream. Two corn tortillas filled with baby shrimp with your choice of special red or tomatillo green sauce and monterey jack cheese. Garnished with sour cream and sliced avocados. Shrimp and crab sautéed with green peppers, onions, tomatoes, mushrooms and spices wrapped in a flour tortilla. Topped with tomatillo green sauce, sour cream, tomatoes, onion, and avocado. Three soft corn tortillas filled with red snapper or shrimp with guacamole, our special mild red sauce and delicious pico de gallo. Delicious! Choice of shrimp or scallops sautéed in butter, garlic, mushrooms, and spices. Served with sliced avocados. Medium hot! 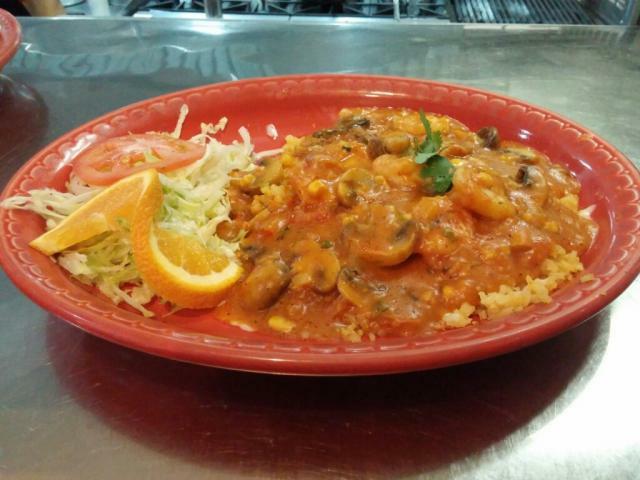 Choice of shrimp or scallops sautéed with mushrooms, onions, bell pepper, carrot, and celery in a delicious Mexican sauce. Served with guacamole. Shrimp. crab, and scallops sautéed with onion, bell pepper, carrot, and mushrooms in a verde tomatillo sauce. Served with sour cream and guacamole. Two corn tortillas filled with crab meat and topped with choice of special red or tomatillo green sauce and jack cheese. Garnished with sour cream and sliced avocado. Eight large prawns butterflied and seasoned with garlic then grilled and served on a bed of rice and fresh lettuce with seafood sauce. Served with warm tortillas. Large braised prawns wrapped in bacon and served with grilled onion, mushrooms, and green peppers. Shrimp cooked in lime juice, cilantro, onions, tomatoes, cucumbers. Mixed with chopped jalapeño, avocados, orange. Choice of shrimp or scallops sautéed with mushrooms and vegetables in a unique sauce and served over a bed of rice with melted cheese. Served with tortillas. Choice of shrimp or scallops sautéed with onions and mushrooms in a spicy green tomatillo sauce. Served with rice and beans and sliced avocado. One crab enchilada and one shrimp enchilada with your choice of Mexican red sauce or tomatillo green sauce topped with tomatoes, green onions and sliced avocado. Delightful blend of shrimp, fish, onions, bell peppers and mushrooms wrapped in a flour tortilla and smothered in our special tomatillo green sauce and topped with avocado and monterey jack. A platter filled with prawns...half sautéed with garlic and half wrapped with bacon served with avocado, bell peppers and mushrooms. Served with rice. Fillet of beef skirt flamed broiled to perfection and prawns of your choice...bacon wrapped or garlic sautéed. Served with Guacamole. Our own special Burger done in the American Tradition! Apples, cinnamon, and spices stuffed in a scoop of vanilla ice cream and topped with whipped cream and strawberries. Chocolate or vanilla ice cream, in a crisp cinnamon crumb coating. Served in a flour "tortilla bowl" and topped with strawberry sauce, honey and whipped cream. Lightly fried flour tortillas with one scoop each of chocolate and vanilla ice cream topped with cinnamon and honey. A crispy honey coated flour tortilla topped with sugar and cream. Pepsi, Diet Pepsi, Squirt, Sierra Mist, Mug Root Beer. Served with Guacamole and one flour tortilla. Choice of Meat topped with one egg over easy.